Directors and Board Members | Crozet Arts: Dance-Music-Theater-Visual Arts-Yoga Ballet, theater, art, music, yoga classes in Crozet, western Albemarle, near Charlottesville, Virginia. Sharon Donohue Tolczyk previously taught ballet on the faculties of the Boston Ballet School, Walnut Hill School for the Arts (Natick, MA), Boston Ballet’s Children’s Summer Dance Workshop, Amherst Ballet Centre (MA), Schwarz School of Dance (Dayton, OH), Wright State University’s PRODANCE (Dayton, OH), Albemarle Ballet Theatre, and at the Greenwood Community Center. At Walnut Hill School, she was a member of the dance department’s ballet faculty, and Director of the Dance Extension Division and Summer Dance Workshop. Prior to her teaching career, Sharon danced with the Dayton Ballet Company and Peridance, a contemporary ballet company in New York City. While in Dayton, she also served as Ballet Mistress for the company and apprentice company, Dayton Ballet II. She has choreographed for the Amherst Ballet Theatre Company, Dayton Ballet II, Walnut Hill, and Albemarle Ballet Theatre. Sharon received her early training at the Princeton Ballet and in London, England. She studied at Walnut Hill School and the Amherst Ballet Centre during high school, and completed the Major Exams for the Royal Academy of Dancing, London, qualifying her as an Associate Member. After graduating from high school, she was a scholarship student for two years at the School of the Pennsylvania Ballet where she trained with Lupe Serrano and performed in the Pennsylvania Ballet’s Nutcracker. During her professional dancing career, she studied in New York City with Maggie Black, Marjorie Mussman, Benjamin Harkarvy, Larry Rhodes and others. She attended workshops with the Twyla Tharp and Paul Taylor dance companies. Since moving to Charlottesville in 1996, Sharon has studied art at PVCC with Chica Tenney, John Hancock, and Rebekah Wostrel, and at Mary Baldwin College with Sue Marion. She was a T.A. at Murray Elementary School, where she also served as Chair of the PTO’s Cultural Enrichment for three years, and was an Art Print volunteer. She is a member of the Phi Alpha Theta History Honor Society. She and her husband, Dariusz, a Professor in the Slavic Department at the University of Virginia, live in western Albemarle with their two children, Adam and Aleksandra. Carolyn Lawlor, Board Chair retired in 2011 after 14 years as Head of School at The Free Union (VA) Country School, preschool through 5th grade. She served for five years on the Charlottesville/Albemarle Commission For Childen and Families and is now a Literacy Volunteer and a Certified Pet Therapy volunteer with her Australian Shepherd, Bentley, at The Kluge Rehabilitation Center for Children, UVA Hospital Coronary Care Unit and The Lodge at Old Trail. Carolyn moved to Charlottesville in 1997 and then to Batesville in 2006. Betsy (Elizabeth) Aronson, Secretary, of Old Trail in Crozet is the parent of a long time cello student at Crozet Arts, and is the Co-Chair of the Old Trail Community Garden. She worked extensively in print publishing for Time. Inc. in NYC and in Alexandria before moving here and sharing her technical expertise with us. She is interested in developing the great potential of Crozet Arts for becoming a much needed center for the arts in Western Albemarle. Bobbie (Roberta) Dill, Co-Treasurer moved to the area three years ago after working alongside her physician husband as nurse and patient educator. One of their books for the lay public is The A To Z Guide to Healthier Living published in 2008 by Revell. After a lifetime appreciation for the arts, her interest in Crozet Arts began when she took a yoga class, experiencing firsthand the health benefits she acquired from her gifted teacher, Scott. Bobbie writes our newsletter’s health feature. Elizabeth Nisos, a long-time resident of Charlottesville and owner of the company Mountain Masonry, practices the art of stone masonry, which she also taught at CATEC for 15 years. Also a hand percussionist, she is active in the local music and art scene and values Crozet Arts for the opportunities it can offer for a wider and more diverse audience. Linda L. Parker of Batesville, a nationally certified Pharmacy Technician (retired), is also an experienced teacher of fiber arts (spinning, weaving, and sewing) and is active in both local and Richmond fiber guilds. She wants to enable everyone the opportunity to participate in artistic activities that nurture mental and physical stimulation, a sense of accomplishment, and lifelong enjoyment. 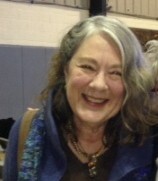 Suzanne Reid, recently moved to Crozet after retiring from Emory & Henry College in southwest Virginia where she taught English and Education classes. Always an appreciative audience for the arts, she believes in the therapeutic qualities of a solid arts education to awake and maintain a sense of glory.